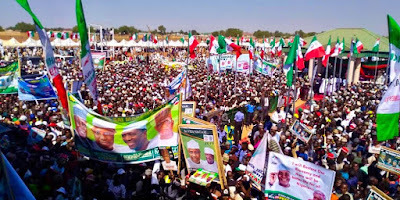 Today at the Presidential rally of the Peoples Democratic Party (PDP) in Ilorin, Kwara state the leadership of the PDP has highlight the need to replace the All Progressives Congress (APC) led federal government which they refers to as a means of ending the nation's multifarious problems. 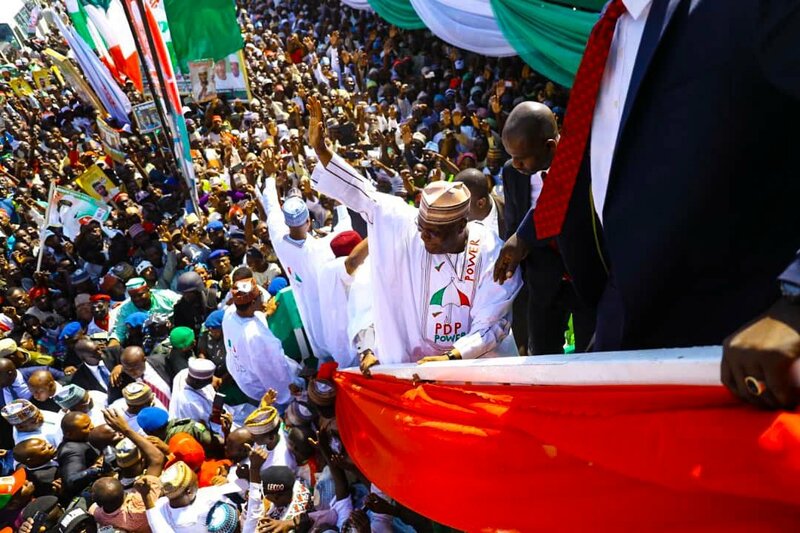 Leading the call was the Director General of the Atiku/Obi Campaign Organisation and President of the Senate, Dr. Bukola Saraki who said the APC led government has failed in all facets of governance. 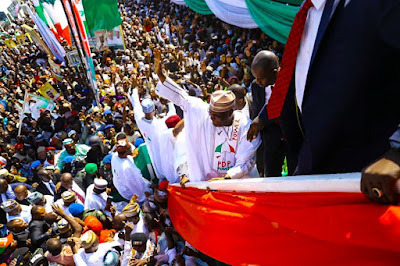 Asking Nigerians to vote President Muhammadu Buhari and the APC out of power in next year's general elections, Saraki lamented that the APC had failed to deliver on all its 2015 campaign promises. According to Saraki, "APC promised Nigeria a lot of things. They promised us security. Then we had security problem only in the North East but now it has extended to North Central and even the North West. APC has failed because security has worsen. "People are dying of hunger because economy has gone terribly bad. They have also failed in fighting corruption. The hunger is serious in the country today.Nigeria is today world's poverty capital. We need a president that will fix the economy, create jobs and unite Nigerians. "This APC government must go because events of the past three years had shown that they don't have solutions to all these problems. We must vote this government out and elect Atiku as our next president. My people of Kwara and North central, we must vote out Buhari. Atiku is solution to Nigeria's problem." Echoing Saraki, PDP presidential candidate, Alhaji Atiku Abubakar lamented that the nation has gone worse under the APC, hence the need to provide an alternative administration that can make things work in the nation again. His words: "They promised us security, job, and to improve the economy but in each of these they failed. It is time for our people to return PDP to power. Because Nigeria was good when PDP was in power. "Today in terms of economy, Nigeria is the poorest in the world. These are facts from international organisations. The security situation has become terribblt bad." Atiku alleged plans by the APC to buy peemanent voters cards from people as a way of perpetraing electoral fraud but urged Nigerians to guide against the plan so as not to mortgage their future and that of their children. In his own speech which also echoed Saraki, the PDP National Chairman, Prince Uche Secondus while appreciating the large turnout of the people for the rally noted that Nigerians have been suffering since APC took over power in 2015. He said, "Look at the genocide in Benue and Plateau states and no arrest was made. APC is a government of propaganda. They can't fool Nigerians again" adding that Atiku has experience in both private and public sectors that can be used positively to lead Nigeria and return it to the path of glory and buoyant economy. His words: "Atiku is a man no one can bribe. Buhari has brought doom to Nigeria and the only man that will bring peace to Nigeria is Atiku. 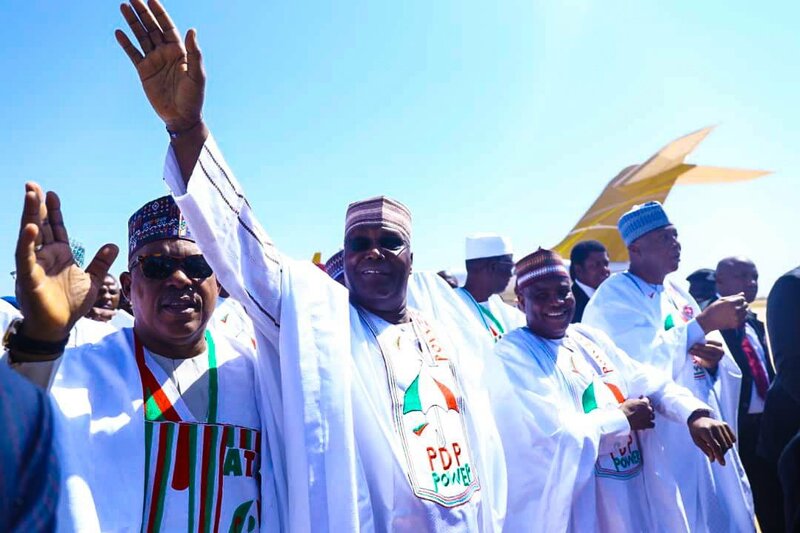 Atiku will bring food, security to Nigeria. "INEC will only cause crisis in Nigeria if they attempted to rig the 2019 election. The election must be transparent. Nigeria will not allow election rigging again. Nigerians must be the soldiers and policemen on duty in election day to protect their votes . We have the best candidate who will win. "One of the APC strategies is to cause crisis and postpone election, so that they can rig as they did in Osun. We will not accept any election postponement." 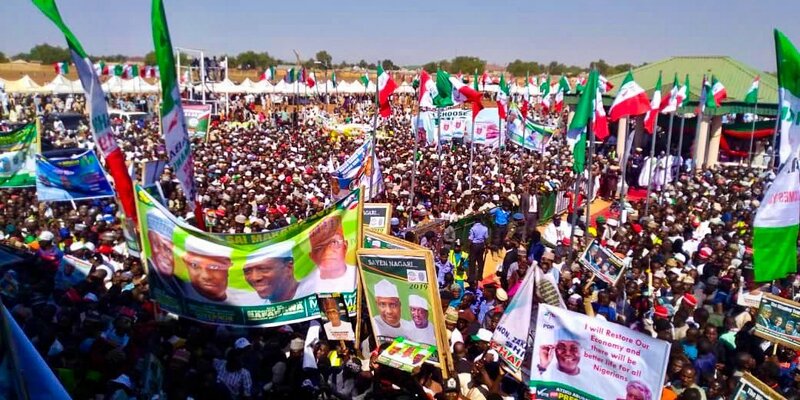 The chairman of the organising committee for the rally who doubles as Kwara state PDP secretary, Alh Rasaq Lawal thanked the people of the state for turning out in large number to honour their illustrious son, Dr Bukola Saraki. 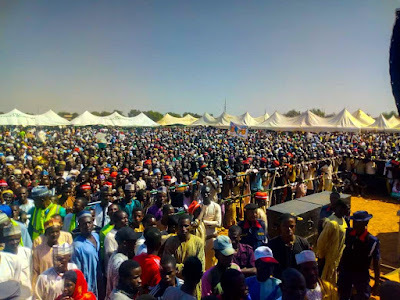 Describing the rally as a huge success, Lawal asked the people of the state to repeat the fit during the 2019 elections by voting massively for all the PDP's candidates across board. PDP flags were presented to the gubernatorial candidate of the party in Kwara, Barr. Razak Atunwa and his counterparts from the north central zone who were present at the rally.